Making dough from scratch is essential in Greek cuisine as we love making a lot of homemade pittes (pies). With this tutorial, you can learn how to make homemade dough easily using your stand mixer. When I made this video, it was my daughter’s first attempt to learn how to make easy homemade dough and roll phyllo manually. I am a very proud mama that she successfully made her first pastry dessert from scratch, a tyropita (cheese pie), which will be posted soon in a separate post. Greek cuisine is famous for its pies and pastry desserts. We love making “pittes” (pies) and the philosophy behind this amazing traditional food was to make good use of whatever they had at hand. Even the poorest people always had some flour and they grew vegetables in their fields or in their garden not to mention the wild vegetables and greens they would forage. If they had a few olive trees, they also had some olive oil. These ingredients are more than enough to make pies. The most fortunate had a few chickens as well to get some eggs and those who had livestock such as goats, sheep or cows would also have milk to make cheese and other products. Of course, those who had a pig had cured meat all the year round. So, even with whatever ingredients they had available, they could make amazing savoury or sweet pies. Put the flour in a large bowl and pour in the oil. Using your fingertips rub the flour until all the oil has been absorbed. (This procedure is called “riziazo” in Cyprus). Add the vinegar (this ingredient is optional and is used to give a crunch to the pies) and then add the water gradually. Mix until the dough is soft but not sticky on your hands. Knead the dough well (this is the most tedious part). Cover with a napkin and let it rest for half an hour. To make the dough in your stand mixer you need to have a mixer with a dough hook. Put all the ingredients, except the water, in the mixer bowl and mix on the lowest speed. Add water gradually and mix, increasing the mixer speed gradually. If it is too thick add a couple more tablespoons water. When the dough starts attaching on the dough hook, increase the mixer speed. Stop the mixer and test with your fingers to see if it is sticky. If it sticks on the fingers, add more flour. Increase the mixer to high and knead for a couple of minutes. Remove the hook, cover the dough with a napking and let it rest for at least half an hour for the gluten to develop before rolling out. Flour: preferably all purpose flour, bread flour, 00 flour or whole wheat flour. You can also make it with gluten free flour, but it’s going to a challenge as it is very difficult, as gluten is a must to roll out the phyllo. Fat: it can be olive oil, butter, lard or vegetable oil. Flavour: Some salt, because salt makes everything much tastier! Liquid: Usually water to bind the ingredients but there are recipes where orange juice is used instead of water, such as the Cypriot Eliopita. To make the phyllo crunchy, you can add some red wine vinegar, lemon juice, white dry wine, ouzo or raki, tsipouro, tsikoudia or zivania (the last four are alcoholic drinks made from pomace). You can also add an egg to the dough and make Provençal Pastry. When the dough is ready it has to rest for at least half an hour not to develop the gluten further but to let the gluten relax so you can shape the dough without it springing back. Depending on the type of flour used, it may require more or less water. This is why the water is added gradually, until we get the right consistency. The perfect dough must be soft, elastic and not sticky on the hands. Some people feel afraid to handle phyllo but it’s not as difficult as it looks. There are two ways that you can make phyllo. One is the traditional one using a dowel and the other is using the pasta machine. How make the phyllo manually using a dowel. There is another technique which I have been planning to show you for you many years now but this will have to wait until I find the time to make the video. Making phyllo on the pasta machine is very easy and you can make it as thin as you like, provided you’ve made the dough right. The only disadvantage is that it only comes out into long stripes. This, however can easily be overcome with the technique I am showing you in the relevant post. Although homemade phyllo dough using a dowel isn’t going to be very easy at the beginning, as it involves a lot of practice to achieve a phyllo as thin as the store bought one, but even if it is less thin, believe me, you won’t want to go back to store bought one as it still makes a flaky and delicious phyllo. Put all the ingredients, except the water, in the mixer bowl and mix on low speed, so that the flour absorbs the oil. 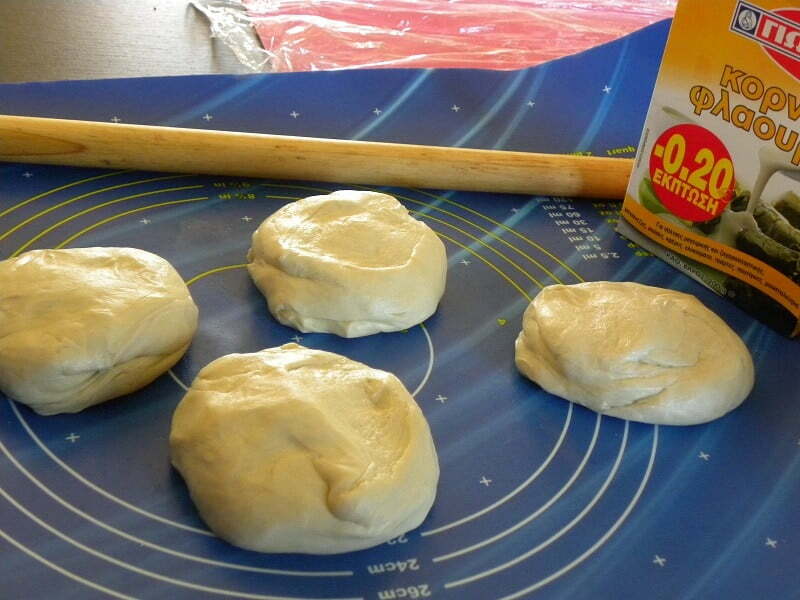 Add the water gradually and mix until the dough starts attaching on the dough hook. Increase the mixer speed gradually to high. Stop the mixer and test with your fingers to see if it is sticky. If it is, add a little bit more flour. This amount of dough is enough to make several layers of phyllo for a 35 x 30 cm (14 x 12 inch) or 30 cm - 12” diametre baking tin. Cool! Does it has the same crispiness as Filo pastry? Very nice recipe i want to try it.